1. Both came from noble Christian families of some wealth. 2. After the death of their parents, both sell all their property and give the proceeds to the poor. 3. Both experience the motivation for their voluntary poverty from the Gospel of Matthew. 4. 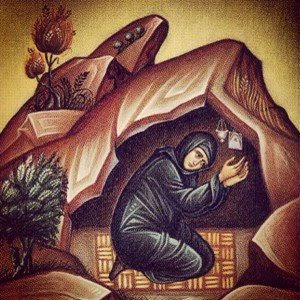 Both retire to a tomb to live out their call, although Syncletike does so immediately, whereas Anthony at first lives on the edge of his village and only later moves to a tomb. 5. What they give up in earthly wealth, they make up for in the hope of future eternal wealth of the kingdom of heaven. 6. Both are outstanding and surpass others in their path of renunciation and ascesis. 7. The imagery of the devil attacking like a lion appears in both vitae. 8. 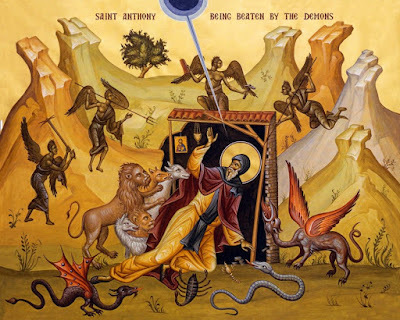 Vigilance against the attacks of temptations (demons) is necessary, fortified by prayer and asceticism and guarding of one’s thoughts. These are themes common to the whole of desert spirituality. 9. The struggle against the spirit of fornication is found in both vitae. 10. Both overcome temptations to impurity by means of fasting, prayer and recourse to the Lord’s help. 11. Both experience the Lord’s strengthening only after a period of solitary endurance, which exercises virtue in the combatant. 12. Both consider the ascetical life an advance in the words of Phil. 3:13: “Forgetting what lies behind, it is useful to strain forward to what lies ahead”. 13. Both have recourse to scripture as one of the major sources of their spiritual teaching. 14. After their withdrawal both appear radiant and capable of teaching others. 15. The authorship of both lives is attributed to Saint Athanasius of Alexandria.